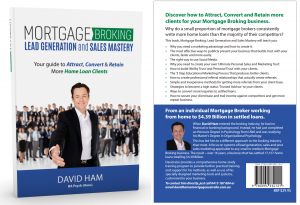 Get the full 422 page eBook of Mortgage Broking: Lead Generation and Sales Mastery PLUS your Building You and Boost Lead Generation Guides AND The 7 Easy Steps to Mortgage Freedom! Mortgage Broking: Lead Generation and Sales Mastery – How to Attract, Convert and Retain More Home Loan Clients. Building You Lead Generation Guide – Practical Resources and Tools to Build Your Broking Business Today. Boost Broker Business Systems Guide – The Engine of of Your Broking Business. The 7 Easy Steps to Mortgage Freedom – purpose written to be the ‘Ultimate Personal Sales and Marketing Tool’ that can be personalised to you, your brand and even your referral partners.